Translation of two kyudo poems from the November 2014 Kyudo magazine article by Iijima - Hanshi. | The Kyudo Project Blog! Translation of two kyudo poems from the November 2014 Kyudo magazine article by Iijima - Hanshi. 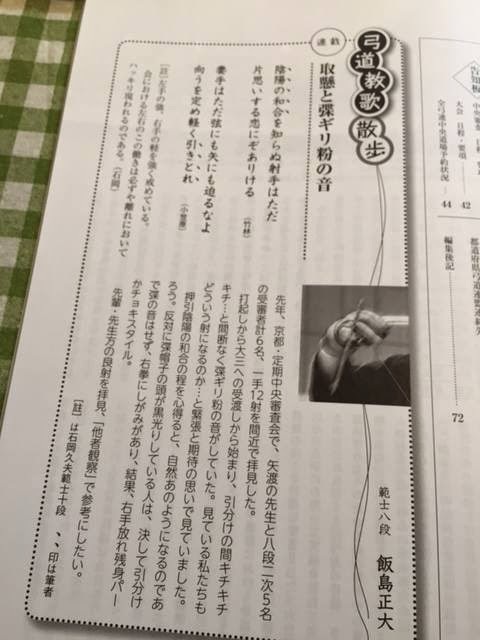 Here's an article in the Nov. issue of the Kyudo Magazine written by Iijima-Hanshi. Here he talks about Torikake and the sound produced from the Giriko on the Kake. Yin-yo no wago wo shiranu ite wa tada kataomoi-suru koi ni zoarikeru. Mete wa tada tsuru nimo, ya nimo semeru-na yo. Mukou wo sadame, karuku-hitotore. After watching Yawatashi and several Hacidan 2nd Shinsa tests, he notices the sound of the giriko from the kake should start as we move into Daisan. The "giri-giri" sound gives one a sense of anticipation of what is going to happen next. Hikiwake is like the harmony of Ying-Yang. If we keep this in our mind, then we will naturally become so. On the other hand, if the the top of the Kake-Boshi (Thumb) is black, then it is likely that in hikiwake, no sounds are produced. Too much strength is placed into the right-hand and as a result in hanare, the right-hand will look like it's doing a shape of a rock or scissor (like rock-paper-scissors).